My love for food and cooking started when I was about 17 years old. I started out making simple dishes like sandwiches and pasta. 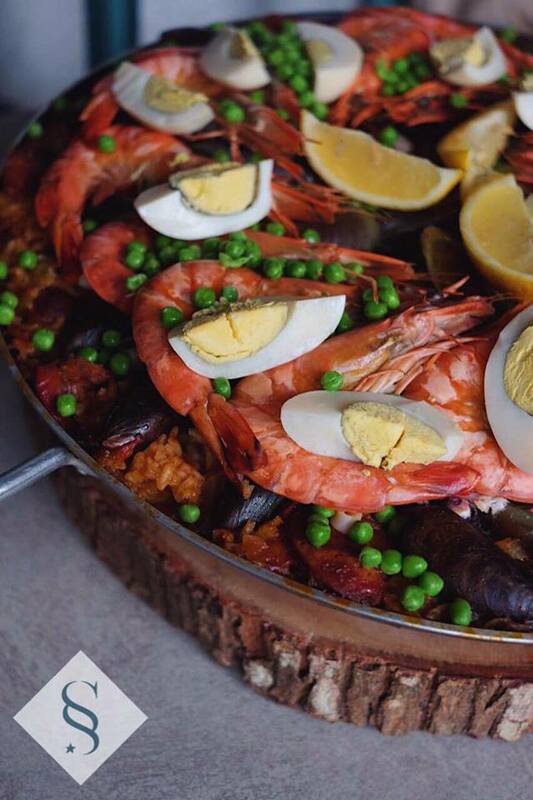 But when I felt brave enough to explore my culinary abilities, I wanted to experiment on making Paella. I actually watch a lot of cooking shows, so I took some tips from different celebrity chefs until I was happy with the texture of the rice, the ingredients that went in and the taste (with the help of my family, which let's face it, is my instant QA team). Please know that this recipe is close to my heart. I've spent years perfecting it. This is what my family asks me to make for special occassions, I even once earned from it when I used to accept food orders. I've shared this recipe only with close friends. Not sure if they've made it themselves because the recipe is a bit to take on. It cooks quickly but the prep is pretty tedious. The sheer length of the recipe is quite intimidating, if I'm being honest. But the results and kitchen skills you'll be unlocking is totally worth it! 3 cloves of garlic, minced. In a paellera or large shallow skillet, pour olive oil and brown all sides of the chicken, remove when cooked and set aside. Sauté onions, roasted bell peppers, chorizo and add the garlic last until onions are translucent. Add the rice in the pan and toast rice for about 2 minutes. At this point, season with salt and pepper and add 2 small pinches of saffron thread. Add the tomato sauce and coat the rice in it. Pour 2 ladles of the hot chicken stock and let the rice absorb the stock and tomato sauce a little. Pour one ladle again and season with salt and pepper. Add the rest of the stock, making sure that the stock is about half an inch higher than the rice (use your thumb to measure or just eyeball it because the stock is hot). Check seasoning and add more salt and pepper if necessary. Add the browned chicken and mussels, arrange in a circle to make it pretty when cooked. Cover with aluminum foil. Let boil at medium high heat for about 10-15 mins with foil on. 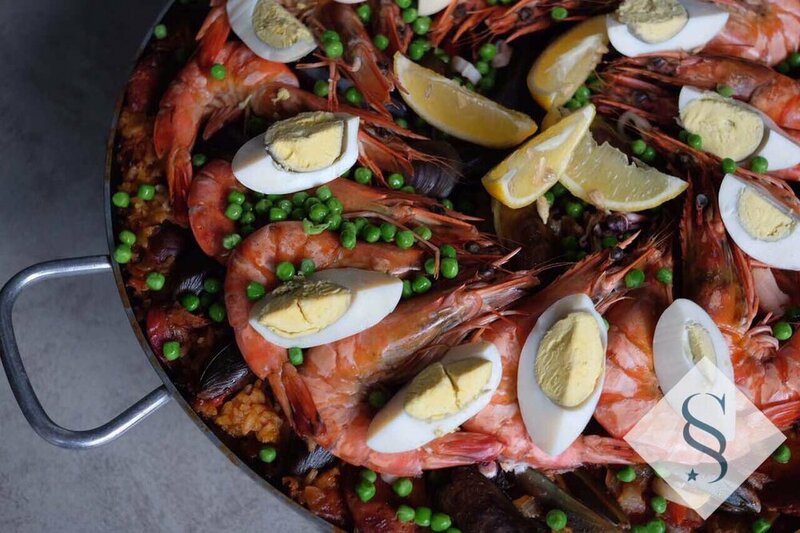 Add the uncooked shrimps and squid on top of the paella which is about 3/4 of the way cooked and cover again with aluminum foil. Cook for 5-8mins more. Uncover foil, adjust to high heat for another 2 mins. It may still look soupy but the stock should now have a stickier and thicker consistency. Before serving, add the frozen peas (don't worry about it being frozen, these will easily warm up), the wedges of hard boiled eggs and lemon. Note: You can cook uncovered for a little bit more time to slightly burn the bottom (which is my favorite part, the "tutong").